One Golden Square in central London is a building stuffed with radio stations. Turn a corner and you might spot Dave Berry presenting the breakfast show from the Absolute Radio studio. Walk up a flight of stairs and you’ll find Kiss sharing a floor with Planet Rock. But those who prefer Mozart to Motorhead would be best advised to keep climbing until they reach the top floor of Bauer Media’s headquarters. That’s where you’ll find Scala Radio, the company’s newest station, which began broadcasting last week. 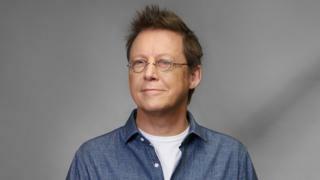 Arriving at its studios seven days on from the station’s launch, BBC News meets Scala’s star signing, Simon Mayo, who is reflecting on his first week on air. “It’s fair to say I’m a lot calmer today than I was last Monday,” he laughs. “It’s fairly tough starting a new show, but when you’re starting a new show on a new station, that was something else. So last Monday was a scary place. The presenter, who has launched his new programme three months after his departure from Radio 2, need not have worried. “Mayo, one of the warmest and most natural radio talkers, again sounds as if he’s somewhere he wants to be,” wrote Mark Lawson in The Guardian. “Despite a few technical hitches, he sounded happy and excited to be back in control of a desk and his own destiny,” said Charlotte Runcie in The Telegraph. The many allusions to Mayo being back to his old self are a reference to the difficult last few months he experienced on Radio 2 Drivetime. Last year, the station hired Jo Whiley to join him as co-host, but it quickly became apparent they had little on-air chemistry, and listeners complained about the change. Since leaving the show in December, Mayo has spoken extensively, in interviews with The Radio Times, The Daily Mail and ITV’s Lorraine among others, about how he found the experience “an awkward, stressful few months”. “There was genuine pressure from the top about improving the number of women in daytime,” he explained. The station now has a much more diverse weekday line-up, with Sara Cox the new host of Drivetime and Zoe Ball stepping into the shoes of Chris Evans, who left the breakfast show in December. “I certainly can’t speak about the new Radio 2 line-up because I’m not a part of it, and I haven’t listened, because I think I’m entitled to a holiday,” Mayo says. Mayo hasn’t left the BBC altogether and continues to front his 5 Live film show with Mark Kermode, but Scala is now the 60-year-old’s main weekday gig. William Orbit, Angelica Bell and Goldie are among the other names bosses at the new station hope will lure listeners. The playlist is varied, with a more mainstream focus than some of its competitors. In response, the managing director Steve Parkinson explained the station has a “70/30” split in terms of the music. “It’s 70% those familiar masters, the Beethovens, but the 30% are things that might surprise,” he said. Mayo recalls: “On one of my first programmes, someone rang up and wanted the theme song to Inspector Morse. Which is an orchestral piece. “The purists will go, ‘I don’t think you can put the Inspector Morse theme alongside Mozart’s piano concertos’, and you might not like it as much… but we could sit down and argue for a long time as to what classical music is. But nailing down exactly what success will look like is tricky. In the last three months Mayo and Whiley presented together, they were pulling in 6.2 million listeners to Radio 2 Drivetime. To go from that to building a new station up from scratch is a nerve-wracking prospect, but Mayo won’t be drawn on exactly how many listeners he’s aiming to attract to consider the venture a success. “I leave those things to the bosses to decide,” he says. “They have shown me figures, [which say] they want this many people by this time, and this is the audience they’re after. To succeed, Scala will have to have a significantly different offer from existing classical stations, which Mayo argues it does. “Radio 3 and Classic FM do what they do very well,” he acknowledges. “The assessment here is there’s an audience that is waiting for the opportunity to join this world.